The film was shot on location at Mohican State Forest and Park, Loudonville, Ohio, Malabar Farm State Park, Lucas, Ohio, and Pleasant Hill Dam in Ashland, Ohio. Part of the film was shot in and around Onaway, Mich., including actor Tim Lovelace’s home. It stars Joe Estevez, Dan Haggerty, Tom Downey, Amber Connor and former pro wrestler Chris Hahn as the title monster. 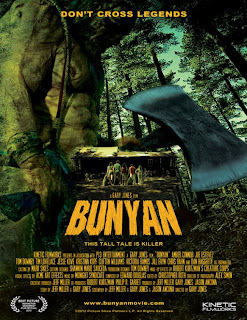 Midwest Movie Maker had the opportunity to chat with the Jones, a Michigan native, and Miller, who grew up in the Carolinas, about Bunyan (which may get a name change to Axe Giant: The Wrath of Paul Bunyan), via email. Midwest Movie Maker (MM): How did you get into film? When did the bug bite? And who are some of your influences? Gary Jones (GJ): As a kid growing up in Michigan, I lived in front of the TV. The house could have burned down around me and I wouldn’t have noticed. That world on the other side of the box drew me in and I was hooked. I wanted to be a cartoonist until I started to see these great “making of” docs, and saw the army of people behind the scenes making the films. I got to see the magic - how they did it – and was hooked. I noticed that the guy who seemed to be most in charge was the director. The director got to be part of every aspect on making the film, and so I zeroed in on that as a profession. I got my start in film by doing special effects in my basement and shooting super 8mm films on the weekends with by pals in the neighborhood. My first job was as an extra on Sam Raimi’s second film CrimeWave. [Ed note: Raimi, director of Spider-Man and Oz the Great and Powerful, is from Royal Oak, Mich., where he began his film career] After that I did special effects for TV commercials and industrials until I made the jump to feature films and producing and directing. 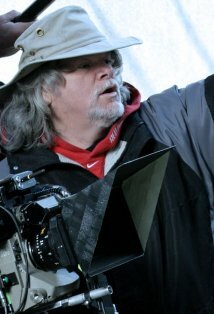 Some of my hero directors are guys like Don Siegel, Robert Aldrich, Alfred Hitchcock, and Robert Wise. Ray Harryhausan and Willis O’Brien are also big influences. MM: You worked on Evil Dead II, Army of Darkness and Hercules/Xena. Can you tell us more about your Raimi connection? GJ: I had read about this movie these guys were going to make and tried to find a way to meet them. They left the state to shoot the film, and I missed out on working on The Evil Dead. A year or so later, I saw a blurb on the news about this movie shooting in Detroit. It was Sam’s second film called Crimewave. I called up the production office and said I would like to be an extra and would work for free. Well, of course this guy Scott Spiegel gets on the phone and say’s they are looking for extras and would pay $35 bucks per day/night. But I would have to drive my car to the all-night location. I didn’t think anything of it. When I got there, I found out why Scott kept asking about my car. Twenty extras were needed to drive on the freeway as background during the crazy car chase in the film–and with their own cars. On the second night there were only about five of us left, ready to freeze in the 20 below weather. I didn’t care – Hell, I was finally on a movie set and met Sam, Bruce and Rob from Renaissance Pictures. From there I went on to do special make-up and effects for Scott Spiegel and Josh Becker’s film Thou Shall Not Kill…Except. That was the start to my effects career, and I continued for several years all the while working toward making my own films. After doing effects on Army of Darkness and Hard Target, I got my core group of filmmakers together and made my first film, Mosquito). I made it a point NOT to try and get anything or ask for money from Sam, Rob or Bruce. Everyone I knew was hitting them up and I wanted to do it on my own. After the film was finished and I had distribution, I sent a VHS tape and poster of Mosquito to Renaissance Pictures. 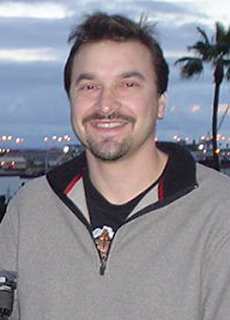 From that I got the job to direct Xena - by proving I could direct and make films and that I wasn’t just an effects guy. Jeff Miller (JM): I grew up in the Carolinas. I wrote my first screenplay at age 18, went to film school at the University of South Carolina, and graduated thinking that I was going to be a screenwriter. Well, it's a lot harder than most people think. I got my first paid screenwriting job at age 23, but nothing happened. I teamed up with some filmmakers in Columbia, S.C., to help produce Freakshow, an anthology horror feature starring Gunnar Hansen ("Leatherface" from The Texas Chainsaw Massacre). After making three features in South Carolina, I moved out to Los Angeles. Through Gunnar (with whom Gary made his directorial debut, Mosquito, I met Gary, who at that time was living in California. We formed a company and decided to make Bunyan our first production. MM: Gary, can you talk a little bit about your work with Ohio filmmakers Precinct 13 and Midnight Syndicate? GJ: Bob Kurtzman [creator of From Dusk Till Dawn] called me one day after he moved back to Ohio and said he was building a studio and I should come back to the Midwest and produce The Rage for him. I felt I had established myself somewhat in L.A. and decided to take the leap and move back. I produced The Rage at the studio with Bob and worked on several cool films doing makeup and visual effects. It was while back in the Midwest that I dove into visual effects, figuring I needed to know all I could before directing my next film. Ed Douglas, from Midnight Syndicate, did our music on The Rage and had raised money to make his first film. He approached Bob and me about producing it. Bob got another gig, so I ended up producing the film while Ed directed. The film The Dead Matter was the result, and Ed and I hit off pretty good from there. Once we got Bunyan going, I called Ed and asked if he would do the score. Ed jumped on board and did a great job creating what I believe is his best work to date. MM: How did you come up with the idea for Bunyan? GJ: The thing that got me most excited was that Bunyan hadn’t been done before. And as a creature movie, the idea of creating this new monster that no one had thought about before had great appeal. We came up with the basic concept right there and developed it over the next few years. MM: What makes the film different than others in the genre? Why will horror fans love it? 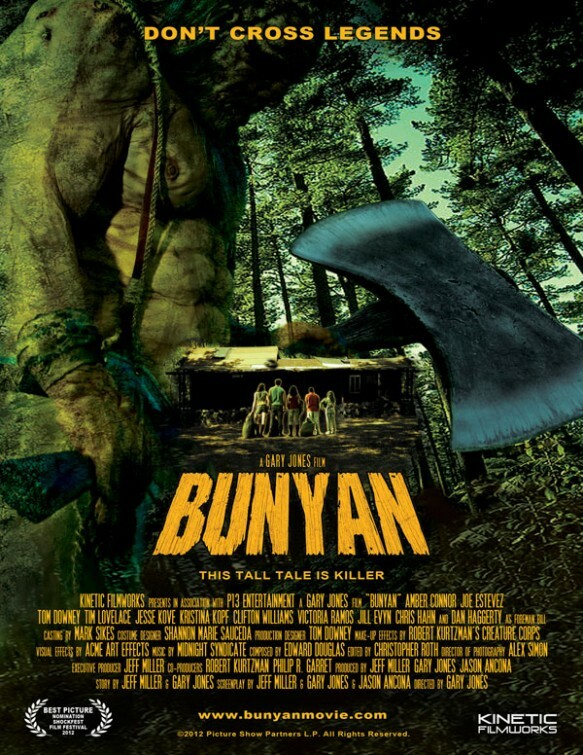 GJ: Bunyan started out as straight horror film with the usual elements. But as we worked on it, we kept hitting a wall. Something didn’t seem right. We liked our first draft, but it seemed like we were missing something special, something great. Ultimately, we found what was missing was this cool back story. Paul Bunyan’s story, and how he came to be. Once we embraced that, we nailed it. It’s one of the things that made our film special. 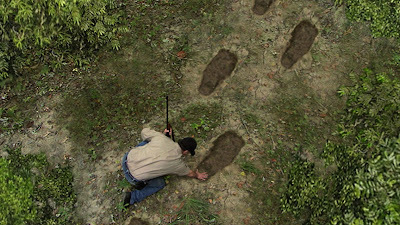 JM: Many films like this wouldn't have a 15-foot giant. Maybe a 6-foot guy with an axe chasing kids through the woods. We have a giant destroying buildings and cars, lots of action, and lots of fun. We hope horror fans will respond to the twist; Paul Bunyan as a bad, but sympathetic character (ala Frankenstein or King Kong). Film Radar named us one of the Top Indie Horror Films of 2012 and said we put more care into the movie than that in most genre movies. And we're proud of that. MM: How did Bunyan come together as a feature? What did it take to get it out of pre-production and have actors in front of the camera? JM: The script went through several drafts. We raised money from investors, did a few days of shooting for a trailer reel, and we finally got to a point where we were happy with the script and had the financing to move forward. Even then, we shot the movie in chunks, as effects had to be built. We didn't rush through the process, which I think shows in the final product. MM: Why was the decision made to shoot in the Midwest? GJ: We made the decision mainly because of the Precinct 13 studio I was working with at the time. We had most of what we needed and I had just produced two films back-to-back there. JM: P13 Entertainment in Crestline, Ohio, is run by our friend and makeup effects wiz Robert Kurtzman, who is a co-producer on the film. So having a great makeup effects shop was a big consideration. Also, we had access to great locations that had not been overused in other films. GJ: I always enjoy shooting in the Midwest because people aren’t as jaded as LA. They are excited and will let you do stuff and shoot places for reasonable rates. On Bunyan we sure got the most out of Ohio and Michigan. In fact, Ohio’s Mohican State Forest was hands down the best exterior we shot at. The end of Bunyan could never have been shot in L.A. on our budget. Shooting in Michigan is always great, like going home again for Christmas. It’s where it all began for me and has a comfort zone quality as well as great locations and crew. MM: Where and when will see Bunyan? JM: We’re close to finalizing a deal for a limited theatrical release in the Midwest, Northwest, and hopefully L.A. in late spring/early summer. Then it looks like we will have a DVD/VOD release in June. The DVD will be available through Virgil Films, a great company that's made a name for itself with such films as Forks Over Knives, Restrepo, and Super Size Me. MM: What one piece of advice would you give an aspiring filmmaker from and living in the Midwest? GJ: It’s all possible now with digital cameras to make films – not so when I started. First you have to really want to do it and not just to make money. Get ready and prepare for some disappointments and failures. JM: Movies can be written and made anywhere. It's my experience, having made movies in the South, in L.A., and now the Midwest, that getting away from L.A. is often the best bet for getting the most bang for your buck. There are capable actors and crew, and locals are often much more accommodating than they are in L.A.
GJ: Go out and make films and never stop doing it. Don’t put a time limit on success, Enjoy it when it comes but remember it goes away fast. You’re never too old to learn something new. Most important is to know the market. Do your research on what sells and for how much. Research the legal side to working in filmmaking and know what to expect. You will be ripped off. It happens to everyone, so take steps to limit the abuse. Always remember films are commercial art. GJ: Bunyan aka Axe Giant was made with blood, sweat and lot of heart and soul. We hope everyone enjoys it and encourages their friends to see it or we won’t be able to continue making cool cool films her in the Midwest. And please buy the DVD while that format is still around. JM: Time's a-wastin' - don't talk about it, get to it!